STOP BUYING LESSON PLAN BOOKS!! 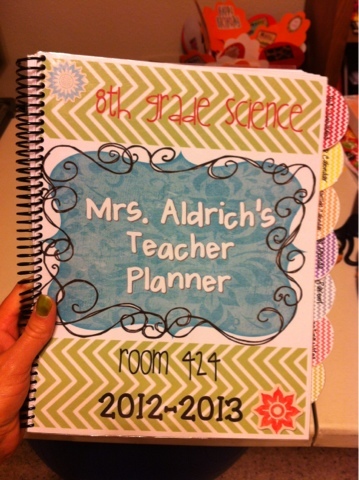 It's so easy and inexpensive to make your own, customized Teacher Planner with everything YOU need in one organized place. Just print everything out at home or school and take it to the nearest office supply store, where they will put clear covers on the front and back and bind it all together for around $5 or less. I've never found a planner/organizer that had exactly what I needed on a day-to-day basis, but this does. HERE IS A LINK to my Teachers Pay Teachers page, where I will post the complete, editable document. Thank you Andrea for the heads up! I've fixed everything now and it should work. Let me know if you have any problems. And thank you for visiting my site! I am interested in making this for my friend who is graduating and becoming a teacher but i have no clue what to include. I don't know much about all the lesson plans and what how much of each page would be needed. Any suggestions? I've purchased and downloaded but having difficulty editing. It won't let me change the font or enlarge it. I"m on a Mac and i've saved it to iCloud and will try again on my work PC tomorrow.